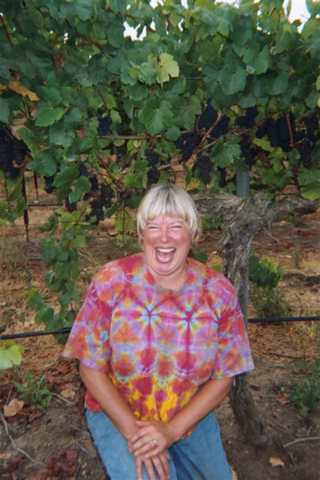 Lane Tanner specializes in Pinot Noir and Syrah. Small Crop But Really Fun! Wine Numbers: 13.8% Alc. 3.50 pH 0.64 TA No R.S. Julia's Vineyard is located about 9 miles due east of Santa Maria and about 3 miles east from Bien Nacido Vineyards in northern Santa Barbara County. My rows.7 through 12, from block B4 (Marten Ray clone), overlook the Santa Maria Valley and are beautifully trellised up for maximum fruit exposure. The fruit came in about a month earlier than in 2006. I harvested the fruit on August 30th, which is on the early side of normal. The 2007 crop was very low so it ripened a bit early. The average tons/acre were a bit less than one..super small crop size. Usually this vineyard comes in after my Bien Nacido fruit.but not this year. As per normal, I was the first to take the fruit which sent other winemakers scrambling to check and pick. The clusters were very small as well, with many "hens and chicks". That is where a cluster has regular size berries and berries that are undeveloped. The crushed fruit was thicker than normal and very concentrated. Yum-Yum.. The fermentation went well. I gently crushed the fruit into four ( 4' by 4' by 4') open top fermenter bins, avoiding the harsh wood tannins from stems. 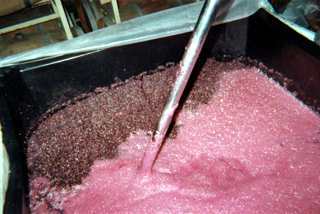 The juice was fermented with Aussmanhausen yeast to retain the fruity components. Punch down routines were performed to maximize the delicate flavors and subtle, elegant nuances of the Pinot Noir grape without extracting the more coarse, alcohol soluble components. The fermentation lasted almost exactly two weeks. This years wine has a bit more oak than my usual wines. That is because I buy my barrels in the spring, before I am sure of crop size.I get the better price if I buy early. My new oak was 33% with 44% of barrels being one year old.of course, all French oak. The wine spent about 11 months in barrels. This amount of new and one year old oak gives me a round mouth feel and a trace taste of smoke without overshadowing the fruit. I bottled the wine on August 1st, 2008, after a gentle filtration to get out the big stuff. This wine was not finned in any way and it may naturally throw some sediment over time. All of my wines are Very low in sulfites because I am personally allergic to them. This wine is very different from any of my other Pinot Noirs, although I make them all the same way. It is the ripest flavor-wise and most substantial structurally of my Pinot lineup. Here the nose is high-toned with red cherry and touches of raspberry and cranberry that introduces round, rich, delicious and attractively sappy flavors that possess fine depth and breadth as well as much better than average length. It is voluptuous with a haunting, smoky quality that is from the grapes themselves, not the oak. This wine will satisfy lovers of Burgundy with its' powerful fruit, satin like texture and hints of mushrooms and earth. I call this Pinot The Haunting Other Woman because it is dark, sensual and rather scary. The Robb Report says this Pinot achieves what few Pinot Noirs do: Marrying the forceful fruit of California with the more delicate mold, mushroom and earth essences we associate with grand cru's of Burgundy. To sum it up, this year's vintage is a bit on the concentrated and dark side. The alcohol is a touch lower. so you can drink more. I'm guessing this baby's going to be a keeper, for those of you that like to collect. Just remember that it is very tasty right now too! Back Label.Lane Tanner has been handcrafting elegant red wine since 1984. You can reach her through her website @ www.lanetanner.com Laugh More-Flirt Often. Wine Numbers: 13.9% Alc. 3.59 pH 0.61TA No R.S. The 2007 harvest was very spotty and light at less than one ton per acre. The fruit came in on September 15th, just four days earlier than last year. This is a bit late, as Bien Nacido Pinot harvest time goes. As per normal, I was the one of the first to take the fruit in block N, which sent other winemakers scrambling to check their rows. The clusters were very small as well, with many "hens and chicks". That is where a cluster has regular size berries and berries that are undeveloped. The crushed fruit was thicker than normal and very concentrated. Yum-Yum... The 2007 Bien Nacido is pure N block, rows 62-76 (Martini clone on it's own rootstock, planted 1973) and is just the happy boyish charm Pinot Noir that we have come to expect from this premiere vineyard. I gently destemmed (100%) into 4' by 4' by 4' open top fermenters, thus avoiding the harsh wood tannins found in the stems. The juice was fermented with Aussmanhausen yeast to retain the fruity components. Punch down routines were performed to maximize the delicate flavors and subtle, elegant nuances of the Pinot Noir grape without extracting the more coarse, alcohol soluble components. The fermentation took about two weeks. The wine spent around 11 months in French oak barrels. This years wine has a bit more oak than my usual wines. That is because I buy my barrels in the spring, before I am sure of crop size.I get the better price if I buy early. My new oak was 46% with the remainder of the barrels being one year old. This amount of new and one year old oak gives me a round mouth feel and a hint of smoke without overshadowing the fruit. The wine is unfined and gently filtered (I call it rock and frog filtering) for visual clarity. I bottled this wine on August 1st, 2008. It may naturally throw some sediment over time. All of my wines are Very low in sulfites because I am personally allergic to them. The 2007 is subtly spicy, layered with an intense red pinot fruit nose that is nuanced by hints of earth, strawberry, plum, blackberry and winter herbs. The mouth is extremely fresh, well balanced and vibrant, with silky tannins and a long and spicy finish. The aftertaste is always sweet and clean. White pepper is lingering along the way. This is a very marked characteristic of many red grapes from the Bien Nacido Vineyard. This is a lovely wine and has an attractive Burgundian element to the mouth feel. Overall it is worth a look for those who like classically styled pinot. Last years Bien Nacido received a 91 point rating from both Burghound and The Wine Enthusiast. I think the 2007 will be a winner too. To sum it up, this year's vintage is a bit on the concentrated and dark side. The alcohol is a touch lower. so you can drink more. I'm guessing this baby's going to be a keeper, for those of you that like to collect. Just remember that it is very tasty right now too and there isn't much to go around! Back Label. Lane Tanner has been handcrafting elegant red wine since 1984. You can reach her through her website @ www.lanetanner.com Laugh More-Flirt Often. Wine Numbers: 14.5% Alc. 3.63 pH No R.S. Julia's Vineyard is located about 3 miles due east from Bien Nacido Vineyards in northern Santa Barbara County. My rows.7 through 12, from block B4 (Marten Ray clone), overlook the Santa Maria Valley and are beautifully trellised up for maximum fruit exposure. The fruit came in on September 27th. This is quite late, as Pinot harvest time goes. It was about a month later than 2005. I could have left them out even longer but I was bored with just standing around the winery, doing nothing. 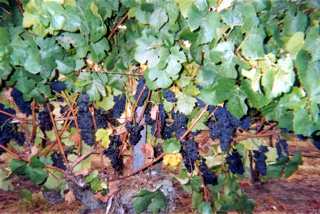 The weather was so mild that grapes just hung there, not getting better or worse flavorwise but mildew was starting to set in. 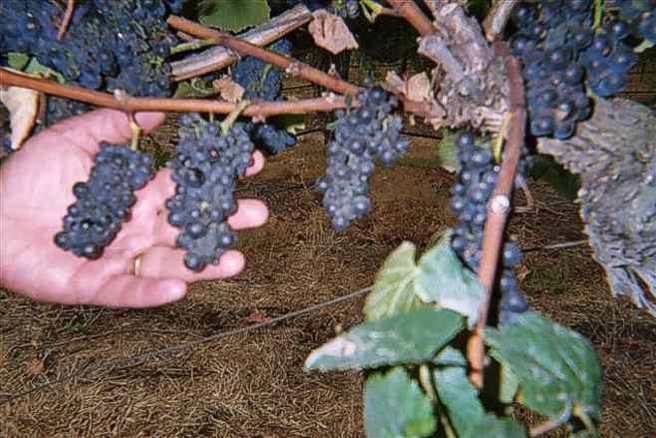 The 2006 harvest was a normal sized crop of around 2.5 tons/acre. The berry size was small but the cluster size was normal. I picked 6.9 tons from my rows. The fermentation went well. I gently crushed the fruit into four ( 4' by 4' by 4') open top fermenter bins, avoiding the harsh wood tannins from stems. The juice was fermented with Aussmanhausen yeast to retain the fruity components. Punch down routines were performed to maximize the delicate flavors and subtle, elegant nuances of the Pinot Noir grape without extracting the more coarse, alcohol soluble components. The fermentation lasted a little longer than two weeks. The wine spent about 11 months in Francois Frere French oak barrels. I used 35% new wood to obtain a round mouth feel and a trace taste of smoke without overshadowing the fruit. I bottled the wine on August 8th, 2007, after a gentle filtration to get out the big stuff. This wine was not finned in any way and it may naturally throw some sediment over time. All of my wines are Very low in sulfites because I am personally allergic to them. This wine is very different from any of my other Pinot Noirs, although I make them all the same way. It is the ripest flavor-wise and most substantial structurally of my Pinot lineup. Dark cherries and black raspberries run through the mouth with cranberries, winter spices and cola. It is very deep and voluptuous with a haunting, smoky quality that is from the grapes themselves, not the oak. This wine will satisfy lovers of Burgundy with its' powerful fruit, satin like texture and hints of mushrooms and earth. I call this Pinot The Haunting Other Woman because it is dark, sensual and rather scary. The Robb Report says this Pinot achieves what few Pinot Noirs do: Marrying the forceful fruit of California with the more delicate mold, mushroom and earth essences we associate with grand crus of Burgundy. This year's vintage is once again, very supple and lush right from the start. The interesting thing about this vintage is that the wine tastes so much like the 2005 vintage even though the harvest was totally unlike 2005.go figure. Drink this wine now or cellar for six or seven years, it will not disappoint you! Back Label... Lane Tanner has been handcrafting elegant red wine since 1984. You can reach her through her website @ www.lanetanner.com Laugh More-Flirt Often. Wine Numbers: 14.1% Alc. 3.48 pH No R.S. The 2006 harvest was very interesting. The fruit came in on September 19th. This is quite late, as Pinot harvest time goes. It was about a month later than 2005. I could have left them out even longer but I was bored with just standing around the winery, doing nothing. The weather was so mild that grapes just hung there, not getting better or worse flavorwise but mildew was starting to set in and the sugars were going up (equating to higher alcohols). The 2006 harvest was a normal sized crop of around 2.2 tons/acre. The berry size was small but the cluster size was normal. I picked 7 tons from my rows. The picking bins looked like a wine magazine layout. The fruit arrived at the winery cold and happy. The weather was so cool, that the fermentations were slower than normal. The 2006 Bien Nacido is pure N block, rows 62-76 (Martini clone on it's own rootstock, planted 1973) and is just the happy boyish charm Pinot Noir that we have come to expect from this premiere vineyard. The nose holds strawberry, plum, blackberry and herbs. The mouth is extremely well balanced with silky tannins and a long and spicy finish. The cool growing season shows up in a bit more tannin structure in the mid pallet than in years gone bye. The aftertaste is always sweet and clean. White pepper is lingering somewhere in the flavors. This is a very marked characteristic of many red grapes from the Bien Nacido Vineyard. I gently destemmed (100%) into 4' by 4' by 4' open top fermenters, avoiding the harsh wood tannins from stems. The juice was fermented with Aussmanhausen yeast to retain the fruity components. Punch down routines were performed to maximize the delicate flavors and subtle, elegant nuances of the Pinot Noir grape without extracting the more coarse, alcohol soluble components. The fermentation took about two weeks. The wine spent about 11 months in Francois Frere French oak barrels. I used 35% new wood to obtain a trace taste of smoke and spice without overshadowing the fruit. The wine is unfined and gently filtered (I call it rock and frog filtering) for visual clarity. I bottled this wine on August 8th, 2007. It may naturally throw some sediment over time. All of my wines are Very low in sulfites because I am personally allergic to them. Pure, perfectly ripened fruit is ever the dominant theme for this baby. Strawberry fruit framed by sweet oak and hints of allspice and mace move into a positively plush finish. This vineyard is becoming very well known and has been featured in a number of magazines in past years including Food and Wine, Gourmet, Wines and Spirits and The Wine Enthusiast( My 2005 received a 91). This year's vintage is very supple and lush right from the start once again. The interesting thing about this vintage is that the wine tastes so much like the 2005 vintage even though the harvest was totally unlike 2005.go figure. Drink this wine now or cellar for six to ten years, it will not disappoint you! Wine Numbers: 13.6% Alc. 3.62 pH No R.S. I am happy to say that the Santa Barbara County Pinot Noir is becoming my flagship wine. It is my 'working girl'. The wine is beautiful, easy to drink and retails at a price that lets one enjoy it often. It is a blend of a few different Pinot Noir vineyards. Yum-Yum! I gently crushed (100% destemmed) into 4' by 4' by 4' open top fermenter bins, avoiding the harsh wood tannins from stems. The juice was fermented with Aussmanhausen yeast to retain the fruity components. Punch down routines were performed to maximize the delicate flavors and subtle, elegant nuances of the Pinot Noir grape without extracting the more coarse, alcohol soluble components. The wine spent about 11 months in Francois Frere French oak barrels. I used about 35% new wood to obtain a trace taste of smoke without overshadowing the fruit. The wine is unfined and gently filtered for clarity. It will naturally throw some sediment over time. This wine, like all of my wines, is very low in free sulfites, because I am allergic to sulfites. This wine is an extremely fun project for me. I get to play with and blend different vineyards which have wonderful smells and exotic new tastes. The fermenting grapes reminded me of fresh crunchy red fruit tied in with earth and spice overtones. It shows a bit more oak than my other wines, which I know will please many of you out there. The mouth feel is so gentle and smooth that one has to be careful not to drink the bottle tooo fast! This year's vintage is very supple and lush right from the start. Every vintage is different. The 2005 was a super soft vintage while the 2006 may be just a bit more full and complex. The wine goes with almost anything. I like to open a bottle when I get home from work and have a glass while I am returning phone calls then I let the lingering tastes guide me through dinner making decisions. The depth and richness of chocolate and violets with cherry overtones matches beautifully with grilled pork or any vegetable medley you can come up with. Back Label: Lane Tanner has been handcrafting elegant red wines since 1984. You can reach her through her website @ www.lanetanner.com Laugh more-Flirt often. Wine Numbers: 13.8 % Alc. 3.70 pH No R.S. All of the fruit for this wine comes from the French Camp Vineyards, located in the mid-eastern portion of San Luis Obispo County, California, high up on a plateau. 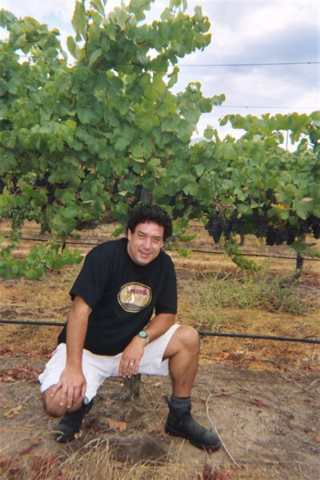 It is owned by the Miller family, the same people who own Bien Nacido Vineyards in Santa Barbara County. This vineyard is in the middle of nowhere. I use block 53 rows 40 through 60. It is a very steep South facing slope and the wonderful thing is that I am such good friends of the vineyard manager, Hank, that he let's me have just the top half of these rows...who knows where the lower part of these rows go. The 2005 fruit came in a month later than the 2004 and was the most beautiful fruit I have ever seen from this vineyard. The normally large Syrah clusters looked almost identical to Pinot Noir..small berry size and cluster size! My philosophy for making this Syrah is to keep it in the more gentle style, if I can. The grapes are the Shiraz clone but made into a much more elegant style than those Aussie wines. The grapes are 100% destemmed. I gently crush into 4' by 4' by 4' open top fermenters keeping the berries as whole as possible. The juice is slowly fermented with Aussmanhausen yeast to retain the fruity components. Punch down routines are performed to maximize the softer, more elegant nuances of the Syrah grape without extracting the more coarse, alcohol soluble components. The wine spends about 12 months in French and American oak barrels. I use one or two heavy char barrels to give it a touch of that smoky-bacon fat smell that makes your mouth water. I use about 30% new oak to obtain a sound backbone without overshadowing the fruit. The finished wine is unfined and only gently filtered for visual clarity. It may throw sediment over time. This 2005 Syrah is a most exciting tasting wine. I always ferment and handle the grapes in a very "Pinotesque" way but it still comes out as a beautiful, elegant Syrah, wine taste wise..that hints at top end Pinot characters. The elegance and gentility screams Pinot Noir while the mouth weight and lingering fruit finish whispers Syrah. The sweet juicy blackberry fruit is highlighted in the palate and the soft black pepper and smoke finish lingers to the next sip. It goes with almost any robust food dish and many light cream sauce dishes. Of course it turns most Asian dishes into a celebration. Speaking of celebration.try it with turkey or ham.yum-yum.It really doesn't matter if your friends think it is a Pinot or a Syrah, they WILL want more. Back Label: This Vintage marks my 25th year in this Crazy Business!